These Horror Lists will provide a handy reference for ALL genre fiction and film fans, giving complete lists of works by the greatest and best writers and directors who have ever worked in the fields of horror, fantasy, sci-fi, pulp and speculative story telling of all kinds. This is the first of those lists and it looks at the creepy cultish fictional works of H. P. Lovecraft, a Master of Weird Fiction famous for his Cthulhu Mythos – an epic vision of a chaotic and dark universe filled with unspeakable horror – which inspired a veritable legion of genre writers then, and to this day, to set their fiction within his strange cultish world. 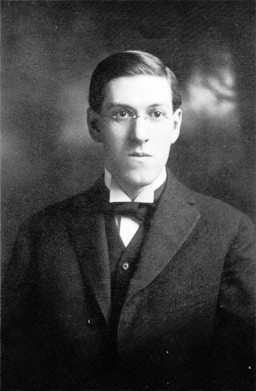 Lovecraft’s influence can be seen in numerous movies and his tales have directly inspired the plots of many others. The figments of his feavored imagination have insinuated themselves into the games world aswell – from board-, card- and role-playing-games to video- and console-games. His dark legacy pervades. This chronological list of his fictional works contains ALL of his extant (numbered) and nonextant tales, including his juvenilia, his collaborative and his revision works, as well as his unfinished fragments. Read a short Biography of H. P. Lovecraft HERE. The Horror of it All’s Lists of Author’s and Director’s Complete Works can be found HERE. Its just Lovecraft for now but more will be added soon so please subscribe to this Blog to keep updated. Also: Harbinger451 is working on a FREE eBook of Lovecraft’s fictional works (including all his extant fiction and with a good spattering of his relevant essays, poetry, letters and even his sketch of Cthulhu) which will be available for download soon – More on this HERE! Enter HERE all those who delight in horror, death, the macabre, the occult, black humor, weird tales, dark fantasy – and all such nefarious pleasures.